Carole is a city of ancient history. It’s a beautiful, historical sea – side tourist and holiday spot. The cathedral and the bell tower are of the year 1000, two important monuments in Carole, and the history of Carole follows an evolution the same as Venice. The historical centre, closed to traffic is a buzz, filled with tourists and locals, street cafe’s, bar’s,restaurants and fabulous shopping. A relaxed Summer vacation spot. 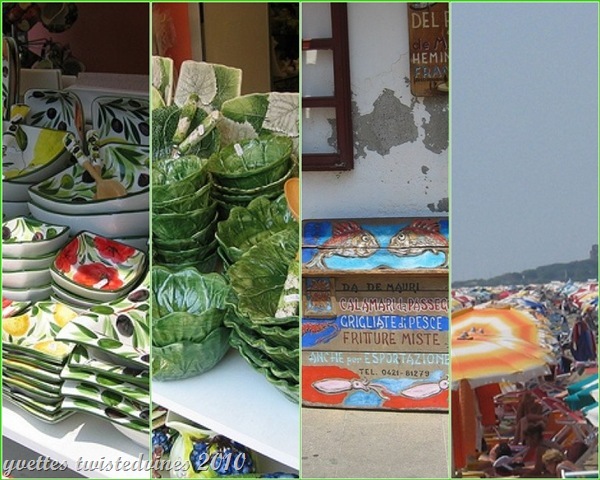 The shops sell their local goods from ceramics, linen,wines,chocolates,and ice-cream. It’s one of those special spots where you can sit outside along the cafe strip,on relaxed chairs,red and white checked tablecloths an espresso or a glass of prosecco in hand and watch the world go by. 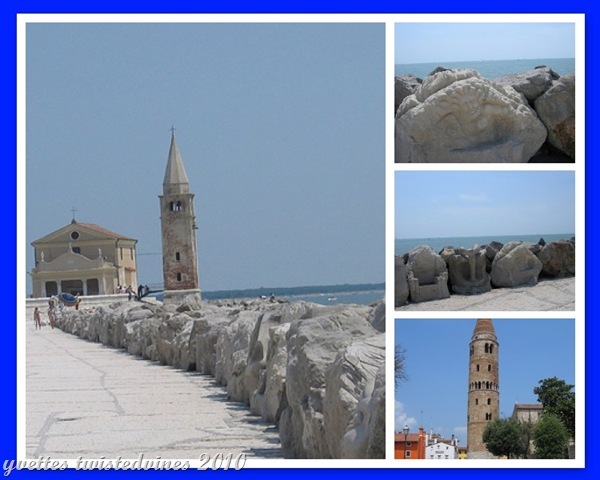 Today, the beach of Carole offers to the tourists who come to visit this part of Italy, all it’s beauty,with it’s fine sand, colourful beach fronts and a view of the Adriatic Sea. The two coasts, the West and East are pleasantly interrupted by a huge stone wall. A beautiful scenic walk along the Adriatic from the beachfront to the church of the Madonna dell’Angelo (Angel Mary) at sunrise or sunset is truly a beautiful sight and a must see. This church is the oldest religious building in Carole and is a sanctuary well known and visited by tourists. It’s rich in history and also known for it’s painted fresco story on the ceiling. The fresco tells the story of how many centuries ago, the fishermen of Carole saw the madonna wrapped up in a ray of light sitting on a marble pedestal which was floating on the sea. With difficulty the fishermen managed to bring it to the bank and put it in the little church, from that time on this sanctuary remains in the hearts of the fishermen of Carole. This open museum wall is more than a kilometer long, it extends parallel to the sea and has been defined as one of the most beautiful walks on the High Adriatic. Protecting the ancient village of fishermen. The wide walk along the sea is protected by heavy massive granite stones made to form an artificial reef, this work started in the 1980’s. 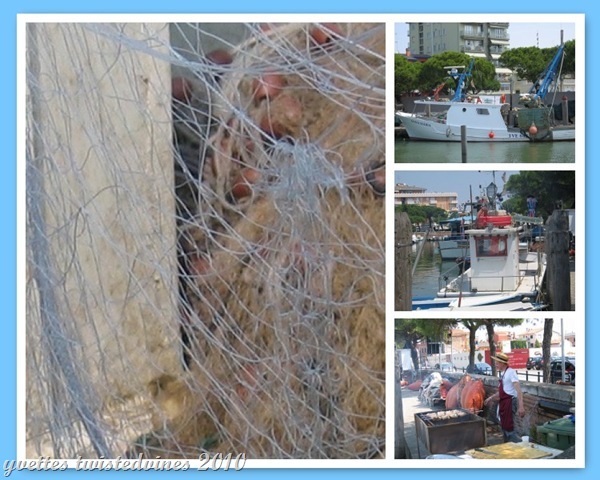 In 1994 the Municipal administration established an international prize called “Scogliera Viva” ( Alive Reef), which is a competition among the best artists for the best sculpture. Every year in June these artists from all over Europe arrive in Carole, for a week, work with hammer and chisel, in an open aired studio,with sun and sea, clouds of dust and curious tourists, for the realization of their work. An image that remains on this open walkway museum, seen and visited my thousands of tourists each year. The fishermen of Carole are a group of men we met,are men who all love their work,craftsmanship and of course the ocean. All have “nicknames”the Prince,Johnny Deep,King of the panocchie,Nano,Lorenzo of Venice. The stories that all of them have and the secrets of their work, the secret spot on the ocean to bring in the best catch, the family backgrounds of fishermen fathers and grandfathers, and not to mention the love of their boats…Mayflower, Allessandro, Briccole..we could have talked for the rest of the summers evenings. A group of men with charisma , all with characters, joyful and friendly folk. It’s worth the visit to the fishing port of Carole and yes there’s many an hour to spend there.The port has always been the centre of activity,and today the fish market is still in front of the port and officially dates back to 1858. 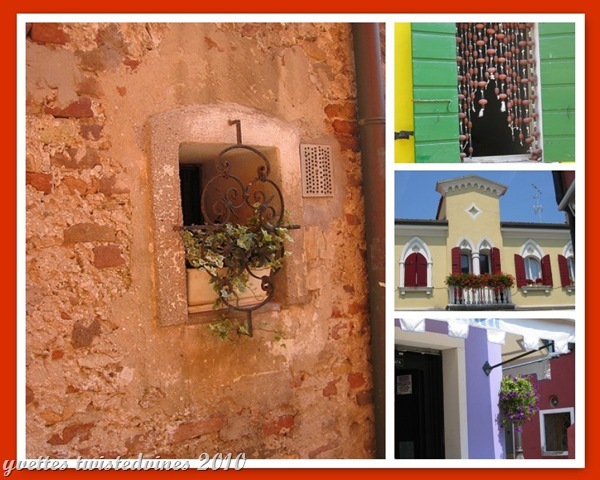 The original corridors in the historic centre are alleyways with cololured walls covered in fishing memorabilia. 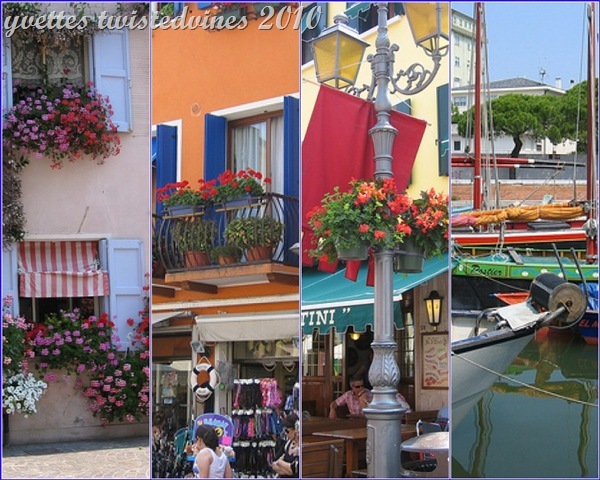 The shutters of the houses are all brightly coloured nowadays covered in Summer blooming flowers. A cololurful visual impact to the eye, and a perfect setting for a relaxed Summer Sunday afternoon visit.